Ten years ago, if you’d told me I’d ever write a book about dogs or animal rescue, I’d have said you were crazy. I was a food and travel writer, and not a natural born animal lover. I wished all animals well, don’t get me wrong. I’d loved my two childhood dogs with all my heart. But I was far more worried about homeless children than homeless animals. Did I mention that I really didn’t want a pet? I did not, writes Laura Schenone. There was a problem, though. My oldest son was a born animal lover, and he was desperate for a dog. In fact, you could say he needed one. Whether it was the universal loneliness of childhood or his own particular version, I don’t know, but this quiet, dark-eyed boy of mine was the seven-, eight-, and then nine-year-old who did not find much fun in sports. Though he loved books, he loathed school. One thing was clear. In the presence of animals, our son was happy and at ease. He seemed to know intuitively how to approach and connect with them. I realised then how selfish I’d been and that it was time for action, not words. That’s why I opened an email one day and learned about the plight of Lily the Lurcher. It came from my friend Elizabeth, who, for years had been gently (and not so gently) trying to get me to adopt a dog from Ireland. She was an Irish-American who regularly went to visit friends and family around Cork. After each trip, she returned with Greyhounds and Lurchers who needed homes. She and I live in New Jersey. Elizabeth explained that she brought these dogs to America because no one over there wanted them. It seemed utterly ludicrous to me that anyone would be flying dogs from Ireland to the U.S., as there were millions of abandoned dogs here. I said nothing, though, because I didn’t want to offend her. Before or after each trip, she sent around emails advertising the next batch of candidates. For years I’d been deleting her missives. The subject line should have prepared me, but it didn’t. When I clicked the email open, I saw horrifying photos of a dog, skinny as death, bent over, scratching herself—all rib, hip, and backbone. She had barely any fur; her raw skin was pink and bloody. One of her eyes looked like it was sealed shut. She’d been found like this on the side of the road. I was stunned. I read on. The rest of the email took the form of a success story. Further down were photos taken three weeks later. The bleeding had stopped, and Lily’s fur was growing back snow white, dotted with black. Her expression was calmer and happier. A caption told of her sweet nature and constantly wagging tail. I scrolled down. More photos - taken two months later - revealed a breathtaking transformation. She was exquisite, with the prettiest face a dog could have. Her eyes appeared to be lined with black kohl, one side smeared. She was a smaller, more delicate version of a Greyhound. In the final photo, one of her ears was flipped back, like hair swept glamorously over her head. Her face toward the camera, she had the eyes of a doe. Someone had found her by the side of the road and taken her to an animal sanctuary where they had bathed her, fed her, put ointment on her skin and got her veterinary attention. The only way to get her into a home was to send her out of the country because in Ireland people did not believe Greyhounds were suitable pets, and especially not mongrel versions of Greyhounds. A few weeks later we were at Elizabeth’s house looking down at a jet-lagged Lily sprawled out on the bed. I bent down to a bit closer and she lifted her head. We held a glance for a moment, her mysterious amber eyes and mine, and then she lay back down in sleepy submission. In this way, Lily the Lurcher joined our family. I am told that in Britain and Ireland most people know about Lurchers, which are historically raised by Travellers and hunters. Today they are often descendants of cast-off Greyhounds from the racing industry. I live in the suburbs outside of New York City, however, where no one has ever heard of them. Lily was a ballerina dog who pranced rather than walked and carried herself regally aloof. Though Lily was feared and unwanted and considered potentially vicious at home, here she was seen as an exotic beauty. People made a big deal. When we went out walking, cars would slow and heads turned to stare at her slim form and unusually elegant bearing. Everyone wanted to know what kind of dog she was. During her first weeks with us, Lily maintained a blank-faced caution. She flinched when we came close, and, when in doubt, she immediately dropped to the floor, one cheek down, as though waiting to be beaten. She seemed afraid of her food and crept toward her bowl cautiously, lest another dog might race in snarling and push her aside. But it wasn’t until we let her run that we understood her true nature. There was a double tennis court around the corner from our house and the first time we snuck her in there and clinked the gate shut, everything changed. We took off her leash and watched Lily tear forth with a speed and form that astonished us. She was a cheetah dog and galloped in a broad circle around the courts, using a special mechanism for running known as the double suspension gallop, which meant she held herself in the air twice as long as other dogs, pumping her rear legs forward and then extending them back behind her, all in a single stride. The overwhelming effect was nothing short of flight. I understood then that she was more bird than dog, more air than earth. For my sons, the story was more or less over when Lily arrived. They had their dog, and a wonderful dog, she was sweet and mellow, with amazing grace and physicality. But for me, the journey had just begun. A few months after we adopted Lily I had the chance to meet Marion Fitzgibbon who was in New Jersey visiting her son. This was 2007, and she was then president of the ISPCA (Irish Society for the Prevention of Cruelty to Animals). She’d also co-founded Limerick Animal Welfare, which was responsible for Lily’s rescue. I expected she’d be some kind of folksy animal person, perhaps an eccentric grandmother, all warm and lovey-dovey. But instead, I was introduced to a tall woman with a straight bearing, more diplomat than a cat lady. When she spoke about animals, she sounded like she was addressing the General Assembly of the U.N. describing children caught in genocide. There was an implicit assumption that animals were important to the well-being of everyone. She wasn’t going to explain it if you didn’t get it. That day, we spoke for a couple of hours. She’d given decades to rescuing animals of all kind, but she was well known as Ireland’s loudest critic of the Greyhound racing industry. She told me that thousands of Greyhounds had gone unaccounted, particularly those who couldn’t make the grade, and those who were no longer able to compete. She explained that Ireland was the foremost breeder and exporter of Greyhounds in Europe, and that was why it mattered so much. A few months earlier, a mass grave had been discovered in England behind a construction worker’s house. It was one acre and contained the remains of 10,000 Greyhounds. Three-quarters of them were identified as Irish dogs. While she was talking, I thought to myself, What kind of person is this? What kind of person appoints herself to do this? I asked her as much. She could tell that I still didn’t understand how animals would be a priority. “Every living creature has the right to live and die with dignity,” she said in a softer, almost reverent tone. I could tell that she’d long ago settled upon this as her religious creed. It was a beautiful idea then and now, but I wanted to know if it was true. And this is why I set about writing ‘The Dogs of Avalon’, which led me into a world of animal rescue and places I could never have foreseen. My journey took nearly ten years and now the book is finally out. I began with the plight of the Greyhound but soon was spending time with people who rescued animals of every kind, from horses and dogs, to farm animals, monkeys and seals, threatened by loss of natural habitat. Lily was my gateway animal. When I think of all that this abandoned Lurcher taught me, I am humbled by all I did not know. She has lived a long happy life with us. 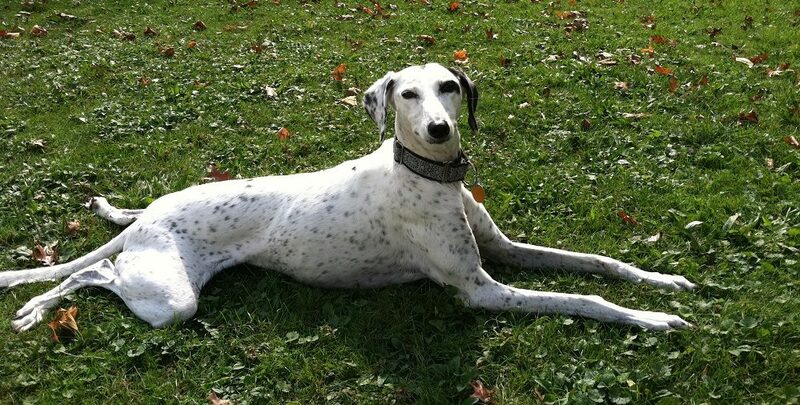 Like most Greyhound-type dogs, she was a wonderful pet, who asked for very little. She gave us far more than she ever took, and she still does. Now ten years after answering that fateful email, my boys have grown, and Lily is always at my side. Laura Schenone is the author of three acclaimed books of nonfiction. Her most recent book, ‘The Dogs of Avalon: The Race to Save Animals in Peril’ is a deeply reported and passionately told journey into the world of Greyhounds, animal rescue, and a band of women who are determined to change the way we understand – and care for – the animals with whom we share our planet.